"Port of Vancouver" redirects here. For the pre-merger port authority, see Port of Vancouver (1964–2008). The Vancouver Fraser Port Authority, responsible for overseeing the Port of Vancouver, is a non-shareholder, financially self-sufficient Crown corporation established by the Government of Canada in January 2008, pursuant to the Canada Marine Act, and accountable to the federal Minister of Transport. 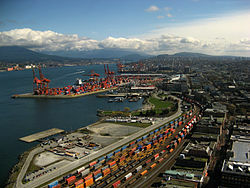 It is the principal authority for shipping and port-related land and sea use in the Metro Vancouver region. In 2014, it was the fourth largest port by tonnage in the Americas, 29th in the world in terms of total cargo and 44th in the world in terms of container traffic. Prior to the formation of the new authority, there were three separate port authorities in the Metro Vancouver region: the Port of Vancouver, which was the largest port in Canada; the Fraser River Port Authority; and the North Fraser Port Authority. Although the ports were financially self-sufficient, the federal legislation governing the authorities generated some inefficiency because the port authorities, legally separate entities, were forced to compete with each other economically for business. This inefficiency came to the attention of the local media in 2006 when it was found that the recently expanded Fraser Surrey Docks, operated by the Fraser River Port Authority in New Westminster, were sitting idle after their principal shipping partner, CP Ships, relocated to the Port of Vancouver, already nearing capacity. Some critics opposed the possible merger as they felt the new authority would not recognize the unique concerns of the Fraser River. To increase the efficiency of the ports of Metro Vancouver, the federal Minister of Transport permitted the three authorities to study the benefits of amalgamating in June 2006. The resulting report highlighted several benefits of amalgamation, and on June 16, Transport Canada granted a "certificate of intent to amalgamate port authorities". On December 21, 2007, the government of Canada published a certificate of amalgamation that allowed the three port authorities to merge into one effective January 1, 2008. 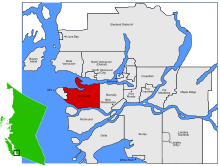 The resulting entity became known as Port Metro Vancouver. Since 2013, the Vancouver Fraser Port Authority also merged with Canada Place Corporation, which formerly operated Canada Place as a subsidiary of Port of Vancouver. On April 6, 2016, the port authority dropped "Port Metro Vancouver" from its branding and re-adopted "Port of Vancouver" to refer to Vancouver's port, while using "Vancouver Fraser Port Authority" when referencing activities or decisions of the port authority. The Container Capacity Improvement Program (CCIP) is the port's long-term strategy to meet anticipated growth in container traffic, which is expected to triple by the year 2030. The program consists of projects that both improve the efficiency of existing infrastructure and explore opportunities to build new infrastructure as demand rises. CCIP projects include the Deltaport Terminal Road and Rail Improvement Project (DTRRIP) and the proposed Roberts Bank Terminal 2 project. DTTRIP will result in infrastructure upgrades that would increase Deltaport's container capacity by 600,000 TEUs (twenty-foot equivalent units), within the terminal's existing footprint. The Roberts Bank Terminal 2 project is a proposed marine container terminal that could provide an additional capacity of 2.4 million TEUs per year to meet forecasted demand until 2030. 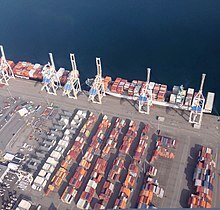 Port of Vancouver offers 28 deep-sea and domestic marine terminals that service five business sectors: automobiles, break-bulk, bulk, containers, and cruise. Warehouse to stock goods before or after loading. Korean statue at Port Vancouver. ^ a b c d e "Wayback Machine" (PDF). 13 March 2014. ^ a b "2008 PMV Economic Impact Study". ^ Port Metro Vancouver. Port Metro Vancouver (2013-09-16). Retrieved on 2014-04-12. ^ "Container docks in Surrey idle after $190m expansion - The Vancouver Sun". ^ "Port authorities set to amalgamate - Delta Optimist". ^ "Port poised to begin expansion talks in earnest". Archived from the original on February 5, 2013. Retrieved November 28, 2012. ^ Gyarmati, Sandor. "Deadline for feedback on T2 is drawing near". ^ Port Metro Vancouver. Port Metro Vancouver. Retrieved on 2014-04-12. ^ a b Port Metro Vancouver. Port Metro Vancouver (2011-03-29). Retrieved on 2014-04-12. ^ Kalosh, Anne. "Vancouver eyes strong season, the last for Ballantyne as cruise moves fully to Canada Place".